Poems from Resurrection Party are being featured on Sundress Publications blog all week long (7/13-7/17) as part of their “Best Dressed” feature, which is exciting for me, as I have never seen those two words applied to anything remotely connected with me before! Here is the most recent entry: https://sundresspublications.wordpress.com/2015/07/15/the-wardrobes-best-dressed-michalle-goulds-resurrection-party-3/ and you can find the others linked below that one. It’s a poem I always feel strange about, because it was written in response to a specific historical event, but I was never sure how or if it was important to convey that context or if I should just let the poem evolve into something else. Over time, I think it has, without it ever really being up to me whether it did or not. In other news, this week I registered as an official songwriter with ASCAP. My friend Amy K. Bormet, a jazz musician and composer and founder of the Washington Women in Jazz Festival, and I have collaborated on a series of four country songs, some live versions of three of which can be heard here: https://soundcloud.com/michalle-gould and the full set of which may soon be released as an EP. 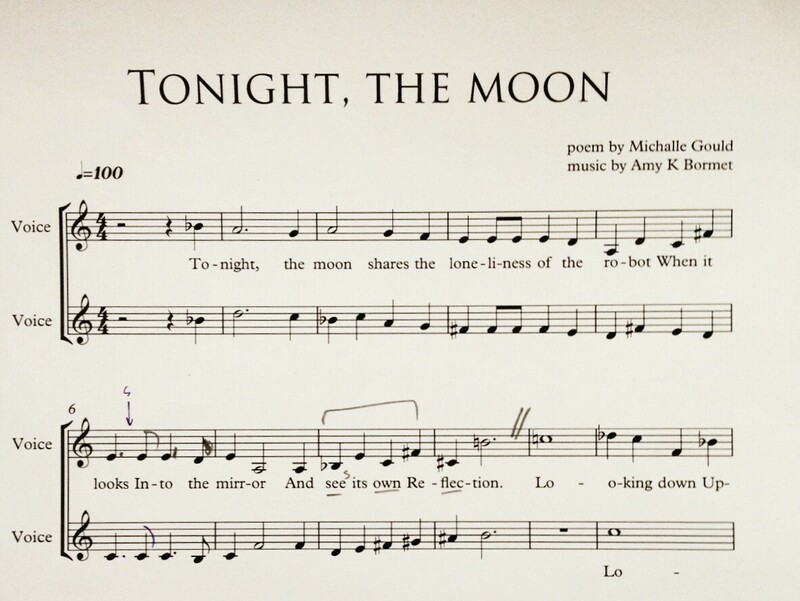 In addition, Amy has also set some of my poems to music and she and another friend of ours, Christine Morse, will be debuting the unaccompanied vocal duet “Tonight, the moon” this week at the Craft in America Gallery. Having my words set to music is a dream that I can not say that I ever really thought would come true. It took probably ten years to find the right musician to be interested in the country lyrics and in working with my poems (the latter is a possibility that I never even really considered), but it was worth the wait to find the right person!